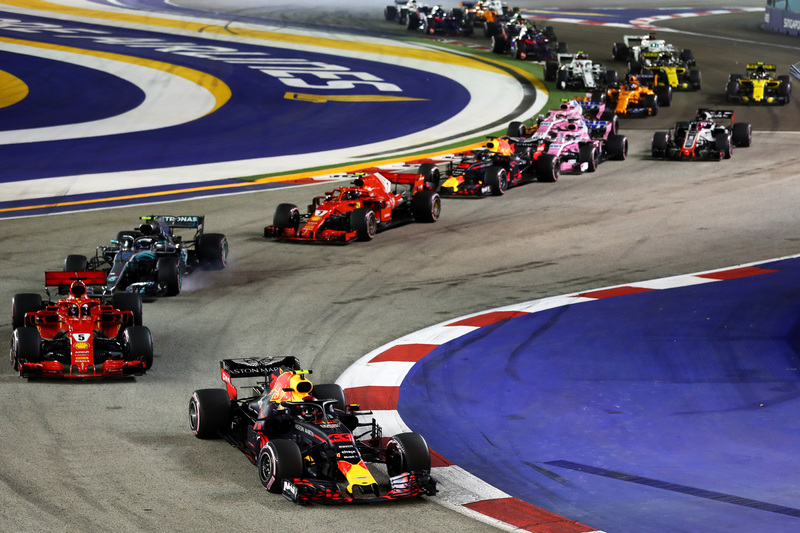 Lewis Hamilton extended his lead at the top of the championship standings to 40 points over title rival Sebastian Vettel after winning a tactical Singapore Grand Prix from Max Verstappen. Vettel had to settle for third after losing out to Verstappen during the pitstop window, the German finishing ahead of Valtteri Bottas, Kimi Raikkonen and Daniel Ricciardo. Fernando Alonso, Carlos Sainz, Charles Leclerc and Nico Hulkenberg rounded off the points-scoring finishers. Starting on pole after one of the greatest qualifying laps of his career, Hamilton led into Turn 1 as Vettel lunged past Verstappen around the outside at Turn 7. From that point, on a circuit where overtaking is so tough, the die was cast – Hamilton’s consistent pace and the Mercedes team’s superior pit strategy paying handsome dividends. Verstappen almost capitalised late on when squabbling backmarkers Romain Grosjean, Pierre Gasly and Sergey Sirotkin held up the Englishman, but he could not find a way past. 2018 Singapore Grand Prix. © Lars Baron/Getty Images. It means that Hamilton now has four victories around the confines of Marina Bay, equalling the record of Vettel himself. He now has seven wins this season and 69 in his illustrious career. “Great job Bono, great job everyone and all back at the factory,” said a delighted Hamilton after crossing the line. “What a weekend. Keep pushing. Keep pushing. We’ve got this, guys. There has been a safety car situation in every Singapore Grand Prix since its inaugural race and it didn’t take long into the latest instalment as Sergio Perez nudged teammate Esteban Ocon into the wall at Turn 2. It was a shame for the Force India team, who bought a raft of tech upgrades, including front wing revisions, new mirror mountings, a McLaren-style turning vane and further bargeboard fin tweaks. 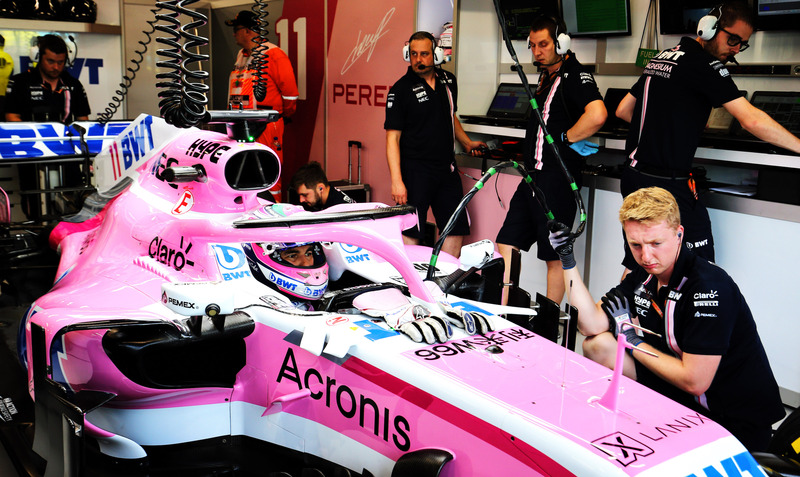 And also for the popular Ocon, still seeking a drive for 2019. Worse was to follow for Perez, who appeared to turn into the Williams of Sergey Sirotkin, ending his points scoring chances. Singapore Grand Prix. © Force India F1. When racing resumed, Hamilton maintained his lead until the early pit stops as the leaders changed their grippy hyper-softs for more durable rubber. Around the tight confines of the Marina Bay circuit, the destiny of the race was always going to be decided by the efficiency of the respective pit crews. Ferrari was first to roll the dice, Vettel pitting first for ultra-soft tyres on lap 15 with Hamilton following a lap later and re-joining in the lead with the more durable soft compound. It was a gamble that backfired, Verstappen edging out ahead after pitting from the lead two laps later. It seemed a confusing strategy that could have been even more damaging had the softer compound deteriorated further, Vettel at one stage proclaiming they would not last until the end of the race. Fortunately, for the German, they did. Yet it was still a bitter blow for the Ferrari man, who now has it all to do to catch Hamilton with only six races of the season remaining. “Overall we were not fast enough,” reflected Vettel. “We didn’t have the pace in the race but also we tried to be aggressive in the beginning but obviously it didn’t work out so after that I think I had a different race to the other guys with a different tyre and I wasn’t very convinced we could make it to the end but pitting was not an option because you lose too much time so we hoped we could make it home. It’s something that Ferrari will have to put right when racing resumes at the Sochi International Street Circuit for the Russian Grand Prix in two weeks time.